We’re making our way back from an outstanding week at Citrix Synergy. Thank you to everyone who came to see us at the booth. 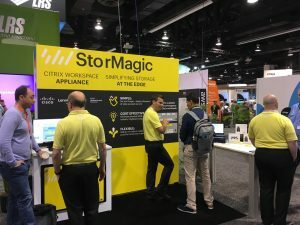 You may have seen that we announced some very important news at the event: StorMagic has teamed up with Cisco and Citrix to launch the first edge appliance designed specifically for Citrix Workspace Services. 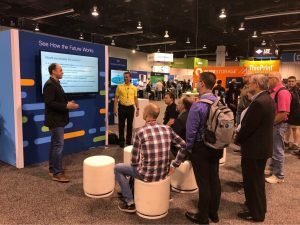 As well as conducting demos of the new system on the StorMagic stand, John Glendenning, SVP of Sales and Business Development, joined the Cisco team in the Cisco booth to talk about the launch with attendees throughout the event. It really was an amazing event, with some awesome keynote seminars, features and special events. 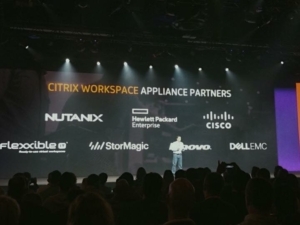 Here is a shot during the opening keynote presentation when Citrix announced their Workspace Appliance Partners. For more information on how we’re teaming on with Citrix and Cisco to connect the edge to the Citrix Cloud click here. 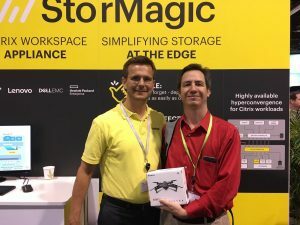 A massive thank you to everyone who came by the booth and asked about SvSAN and a huge congratulations to our three drone winners. Our next event will be Cisco Live in Orlando, Florida in June. We hope to see as many of you at the StorMagic booth (#1937) as possible! If you’re attending the event and would like to book a meeting with the team then please do so by emailing [email protected].